Hybrid clothing—think sneaker boots and sneaker sandals—have a bit of a polarizing quality. The two-in-one identity can veer toward either genius or gimmick, depending who you ask. I happen to feel the shacket trend falls squarely in the former. What is a shacket? Think of it as either a very lightweight jacket that can be fastened up and function as a shirt, or a heavier-weight shirt that serves as outerwear. Frankly, it’s kind of a fun word to say, too. Over the past month or so, as weather (especially on the East Coast) has moved from sort of chilly to borderline freezing, I’ve started to see more of the in-between, multifunctional piece more, specifically in denser fabrics like corduroy and shearling. The reason it’s so appealing is its ability to transition between seasons with ease; one month it can be worn over a tank, and the next it’s piled under a peacoat. Below, take a look at the transitional piece that’s key for layering or wearing solo. Your shacket, your call. 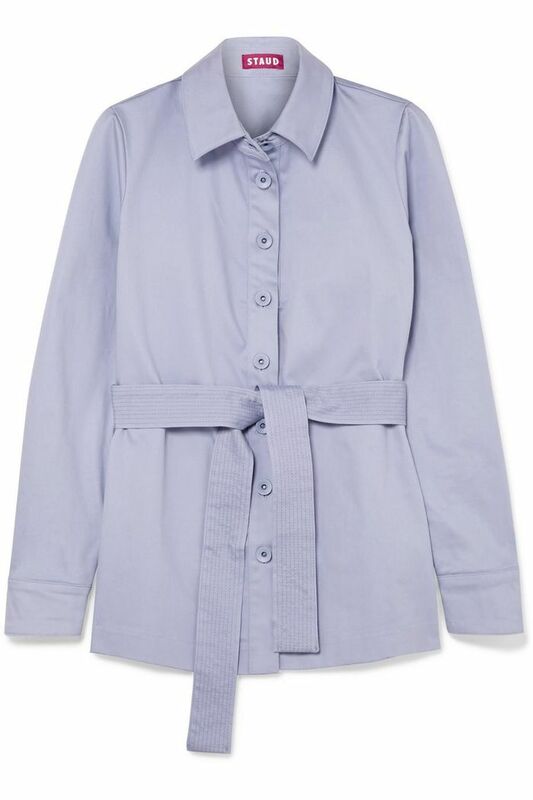 This belted cotton piece appears light, but its fabric is nice and weighty. This oversize fit looks especially cozy. The contrast stitching makes this pop a little extra. Technically a trench, it can absolutely be worn solo. This light wool jacket can be your base or your outfit's final touch. Sure, throw a little ruffle in there. This plaid version feels especially fall-appropriate. Isn't it all about that lining? A white turtleneck would look amazing with this shade. Nanushka is already behind so many of our favorite winter jackets. This lighter one is a winner, too. Are you convinced you need a shacket yet? Our fall, winter, and likely spring wardrobe needs this. A classic, goes-with-everything corduroy shacket. Try a moody floral print to mix things up a bit. It's not every day we see color-block corduroy. We can't help but think how functional these oversize pockets are, as well. The neon threading makes all the difference here. Next, shop the seven biggest accessory trends for fall, all under $100.